Besides make up - I believe that our accessories : earrings, necklaces, hair pieces are the 2nd biggest collection in our wardrobes. THUS.. making storage is always such a struggle. But for the rest.. it's just tossed into a drawer unfortunately, divided into sections with plain white plastic square baskets from the dollar store. 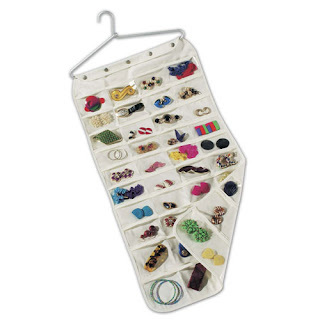 I'm looking to re-organize my stuff so I thought I would ask you readers...what methods you use to store your accessories ? and I do heart this hanging storage thing - it keeps everything out sight too - nicely hidden in the closet !! mine is double sided too :) that's so funny. I know her jewelery collection is amazing. I just don't know if I could fit it all into that, I have normal jewelery and then gawdy Indian jewelery haha.